EASTER MIRACLE IN DOGDOM This heartwarming rescue story began many years ago, sixteen to be precise. It’s a story based on kindness, friendship and how what one does in one’s life can have a huge impact in the most unlikely ways even many years later. Karma, fate, providence, luck or divine will? Anytime an animal is rescued it’s special, but sometimes God’s hand is most apparent, the stars appear to line up properly, and compassionate people, who are bound together by a cause, step up and a miracle happens. AND SO IT BEGAN- Early one fall, Gordon and I made a second trip to my cousin’s in Massachusetts. That area has always held a significant spot in my heart because it was where my parents and I spent many summers when I was a child and I had made numerous visits there as an adult. We settled in and Gordon quickly picked up the morning routine he had established during another visit just two months before. Down the road from my cousin’s was a wonderful deli/grocery/bakery called Bruni’s. Emphasis on the word bakery, because it truly had a bona fide bakery and there was no place on earth that could top their blueberry muffins and chocolate croissants! Early each morning Gordon would head to Bruni’s for coffee and a box of their decadent delicacies. But on this particular morning, the one which would begin this improbable story, things took a slight turn. KISMET #1- Little did Gordon know when he got dressed that morning, his choice of shirts would be the catalyst for the “Easter Miracle in Dogdom” some 16 years later. It looked like a regular golf shirt, but it had our bull terrier club logo embroidered on the pocket area. That morning, as he ascended the steps of Bruni’s, he saw a woman in riding attire, drinking a cup of coffee with a beautiful bull terrier by her side. 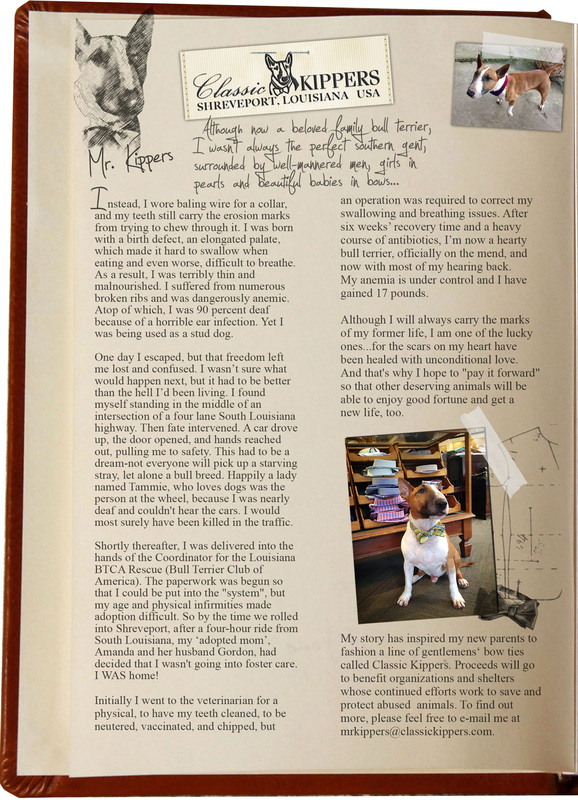 KISMET #2- The lady saw Gordon’s shirt and he saw her boots and bull terrier. He told the lady, who introduced herself as Becca, that we had bullies and that his wife rode. He sat down and they visited. A bit later Gordon returned to my cousin’s with coffee, a few decadent delicacies and was heralding news that I had a date to go riding that very afternoon! I told him that I had no boots with me and he proceeded to tell me the story of meeting Becca and that she would have a horse and boots ready for me at 2PM. Becca and I spent the afternoon riding through some of the most beautiful country in the world. We were legging up polo ponies, astride one and each ponying (leading) another. I was also introduced to deer flies that day and decided that they definitely rivaled our Southern mosquitos! I told her that the first time I ever sat on a horse in my life, had been just down the road in 1955 when I was a year old. I told her that in the summers my parents used to rent a home and stables from a local veterinarian who summered in Rock Port. Becca asked me if I remembered the veterinarian’s name. I did and when I told her the name-she grinned. KISMET #3- The veterinarian’s daughter is a good friend of Becca’s. A few nights later, Gordon and I met Becca and Bic at the Black Cow Tap and Grille for dinner. It was a lovely evening and a new friendship was born. Some years later, Gordon decided to join me Foxhunting, but he needed a suitable mount. I had looked everywhere to no avail and then I saw an ad online for a big gray field hunter. I looked at the area code and realized it was Massachusetts, the big gelding was too far away, but he seemed perfect for Gordon -so I called anyway. KISMET #4- In all of Massachusetts, what are the odds that the horse was stabled in the very town where my cousin lived? I then called Becca on a lark and asked, by chance, if she knew the people who owned the big gray. KISMET #5- She not only knew the owner, but she knew the horse. It was in February I believe, and there was a great deal snow on the ground in Massachusetts. Bless Becca, she rode him in the snow for me, took pictures, handled having him vetted, prepped him to ship, oversaw the sale and his being shipped to Louisiana. He is still with us and still the clown of our barn. Not long after that, Bic came South for a visit, but unfortunately Becca was unable to come because of the restraints of her job. We had a great time and I sent Bic back with a suitcase full of old “BARKS”, which is an English bull terrier annual. I knew that she would enjoy perusing them as much as I did. 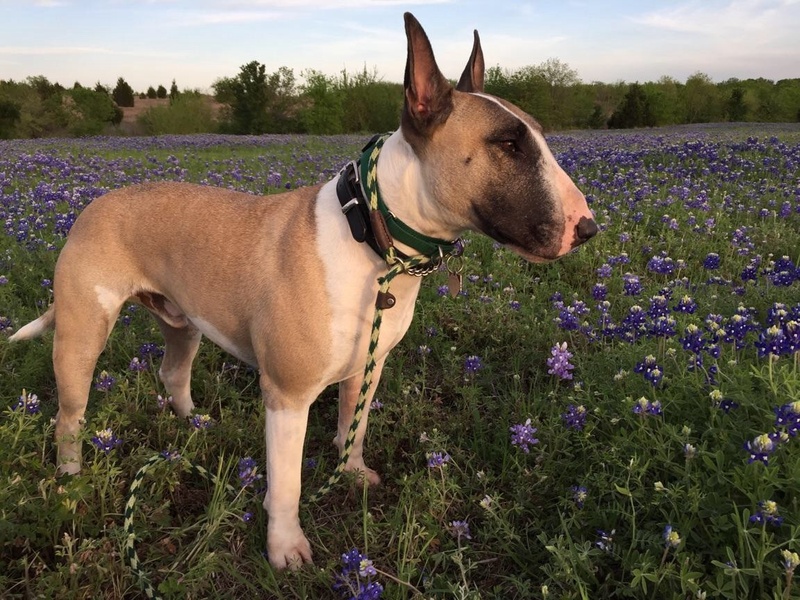 Through the years, Becca and Bic have seen one of their bull terriers go to the Eukanuba National Championship at least once. One beautiful girl was an early Target dog and was on hand when Target opened their NYC store. Their last English bull terrier was the magnificent and incomparable “Sped” who owned them. Sped was born bilaterally deaf and according to the veterinary school at Tufts University, when the Baer Test was administered, had the flattest “flat line” of any dog they had ever tested. In other words, he was stone deaf. No matter, this handsome bully boy, under the patient tutelage of Becca, learned sign language. She also taught him skills that are often difficult for bull breeds who are NOT hearing impaired. Nothing stopped Sped. He and Becca were a team. Sped did tracking in VT, underwater search and retrieval, outreach at both schools for the deaf and schools for children with special needs. (If you aren’t familiar with canine underwater search and retrieval, do look it up. 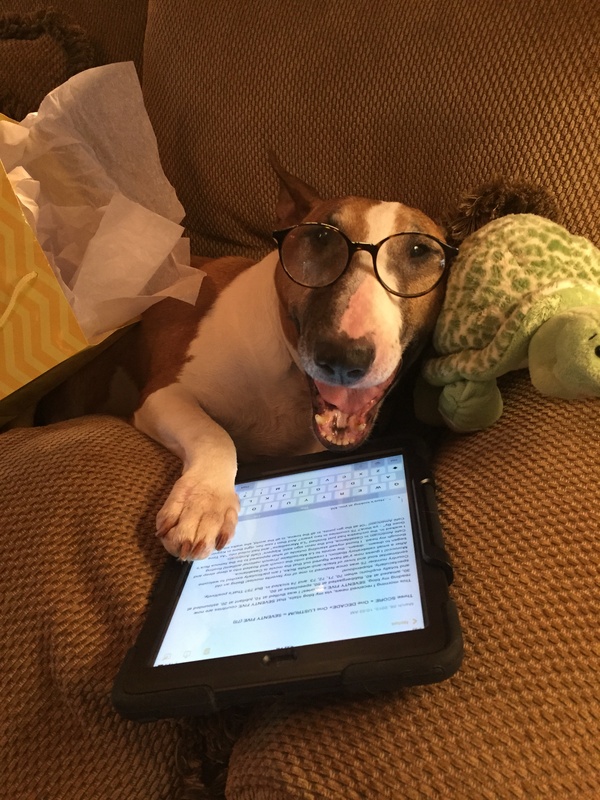 And, if you really know bull terriers, you will be even more impressed by Sped) But Sped’s greatest accomplishment was his care of his master. 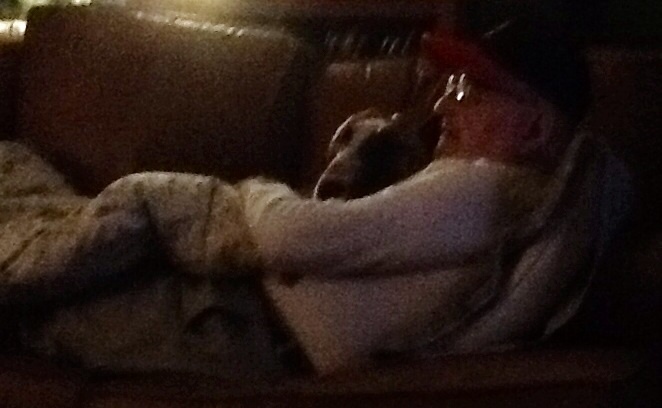 After Bic was diagnosed with Parkinson’s, Sped became his primary caregiver and comforter in chief. In other words, he became a service dog. KISMET #6- Facebook has been an incredibly wonderful tool for many to stay in touch or rekindle old friendships. In this story, it became the hinge pin for the “Easter Miracle in Dogdom”. THANK YOU MR. KIPPERS! You see, Becca and I had not really kept up over the last years. My cousin passed away, so we no longer traveled to Massachusetts and our emails became few and far between. However, quite a while ago, Becca tripped upon Mr. Kippers’ blog and found a link back to my Facebook and asked to be my friend. It was there that we could correct outdated email addresses etc. Since then we have kept up and she has followed both Mr. Kippers and the rescues which I have posted. Two days before Easter I noticed a post on Becca’s page that made me smile and gave me a happy heart. There sat Sped all decked out in birthday beads and a party hat, celebrating his 12th birthday! That’s getting up there for a bully, but Sped looked wonderful! Then, a couple of days later, I noticed that Becca had made a comment on my FB page that my rescue buddy Susan and I had done a “good job” on a recent shelter rescue and that their house was “too quiet”. I shuddered. 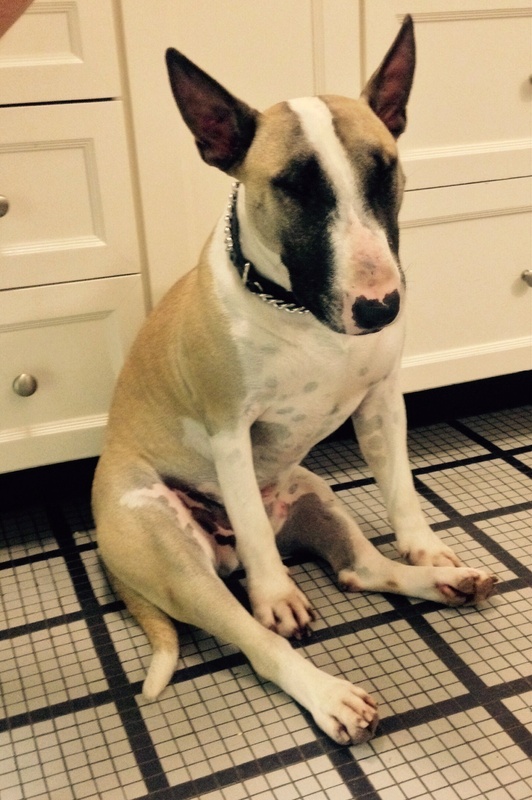 No house, home to a bull terrier, is ever quiet. Even if they are on the couch asleep they are snoring! I started to send a message and inquire as to what that meant. But in my soul I knew. I hadn’t talked to Becca in a very long time, but I had to call. She answered and all I could choke out was “What happened?” She told me that the great Sped died unexpectedly in her arms- all 80 pounds of him. Yes, exactly 12 years and two days after that 7oz (Really! 7 ounces!) bundle of bully arrived into a totally silent world and after he accomplished more in his life than a very, very few ever do, he left the world and people he loved most on this earth, as quietly as in the world in which he lived. It was Easter Sunday. Some people say, “I don’t want another dog now” or “I can never love another dog as I loved “Fido”, but a person who truly understands what it’s like to have loved and been loved by a special dog, knows that although that dog can never be replaced, there is room in one’s heart for another. As Dean Kountz said, “Once you have had a wonderful dog, a life without one, is a life diminished.” Becca had lost a special friend indeed, but Bic had lost far more. Bic who depended on Sped for companionship and for service since diagnosed with Parkinson’s, was left reeling. Becca said that he was truly distraught. They both were. “I would like to have had that white puppy you just rescued” she said. “No you wouldn’t, she will be too small and you like big dogs.” I told her. While we were chatting, I kept thinking about the big rescue boy that I had wanted for myself, but gave up because I needed a bully under 50 pounds. I had fallen in love with him and still thought of him daily and prayed that he would get a perfect home. 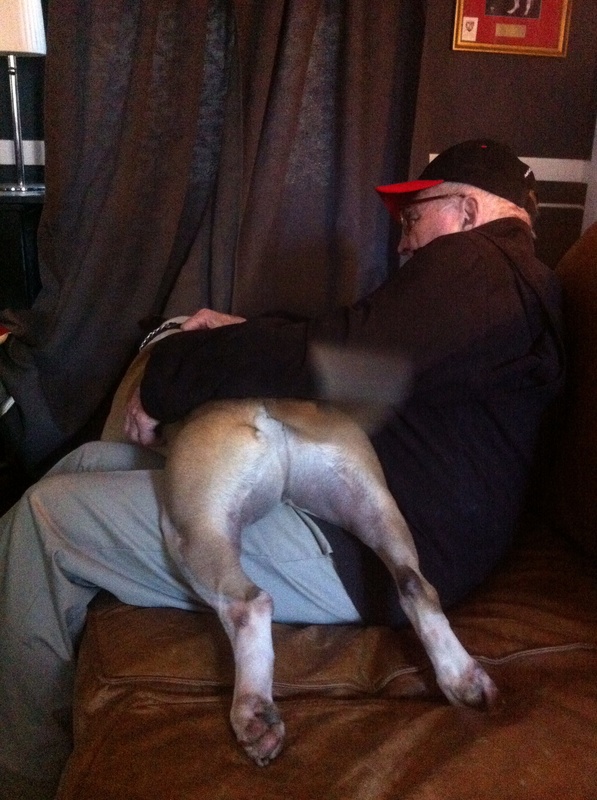 I knew that fellow rescuer, Pegg, who had him now, wouldn’t let him go to just any home. What a guy! 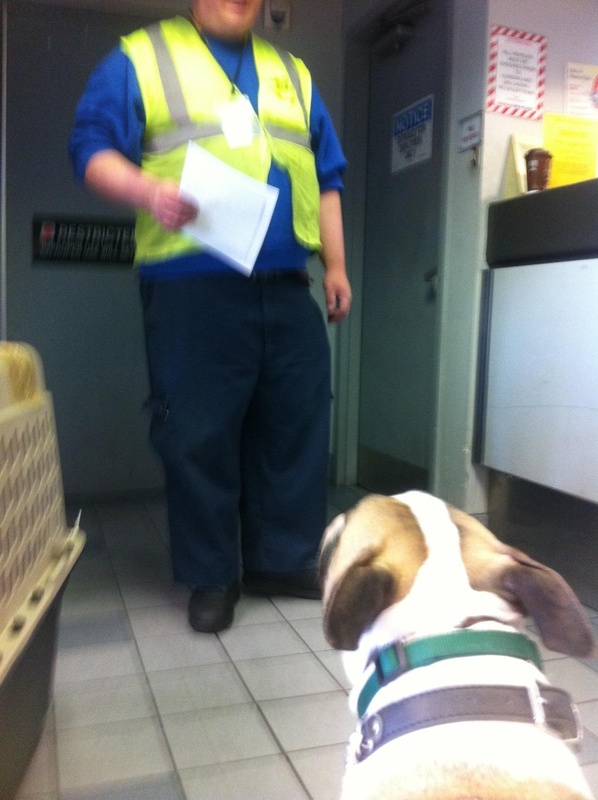 All whose lives had been touched by this dog, even the transporters thought he was awesome. Unfortunately, through the angels of animal transport, he was now 350 miles from me and waiting to meet his new people. It was too late. I kicked myself, knowing that this dog and Mr. Kippers were, bar none, the two happiest and innately bright rescues I have ever known. That big ol’ bully boy would have been perfect for Becca to train as Bic’s new companion. I was literally heart-sick because this wasn’t just a couple who needed a new dog to love; Bic needed a companion- a service dog. There are lots of rescues out there needing homes, but it takes a special dog and special training to become a service companion. We’ve got more dogs in foster care than we have applications and more rolling in daily-but he was SPECIAL! I had called Becca on a lark about the horse that seemed so perfect for Gordon, yet so far away, so many years ago and she made it happen. Why not check? What would it hurt? I asked Becca if she was really serious about a new bully and she said she was. I quickly gave her details, but told her that it was a very long shot, but to sit tight and I’d call Pegg who was fostering him. My voice was quaking as I inquired as to whether the big bully boy had gone to his new home. KISMET #7- By some twist of fate the adoption had fallen through, though by no fault of the big sweet bully. I explained the situation to Pegg and I asked if there was any chance that he might be available to go to Massachusetts. It would be a home where he could be trained for service and that I would personally vouch for Becca, on top of her filling out the necessary adoption forms. KISMET #8- Pegg said YES, but there would be a lot to do. Almost 2000 miles separated this big bully from a perfect home and from the arms of people who not only wanted him, but truly needed him! These are people who have had some incredibly well-bred bull terriers through the years, but they didn’t care about the fact that this big bully was a rescue. Another leap of faith. I had trusted her on the horse many years ago and now she trusted me that the dog was everything I said he was. This big bully boy had but one major fault and all of those who transported him knew of the problem. I explained this issue to Becca, whose reply was, “My dogs are always my copilots!” The fault? He has to sit in the “shotgun” seat. No really, he must. (yes that habit could be altered with proper training, but none of us had him long enough to work on it and besides, it made us all laugh!) We had a green light, but it was going to take a well-orchestrated plan to pull this off. If you’ve never been privy to watching a complicated rescue and delivery unfold, then you’ve missed something wonderful! There is nothing more heartwarming and satisfying than seeing the fruits of rescue labor come to fruition in the lives which are touched and brought together, whether they be the rescuers, transporters, new owners or the dogs themselves. Most dogs would have fretted terribly had they been moved around as much as this big fellow had in the last three weeks, but that was not the case with this bully boy! Honestly, I think it was a great adventure for him! He was just grateful for all of the love and attention he was getting as well as getting to ride shotgun! In the past month, this beautiful fellow was rescued by Shannon. Mike picked him up from Shannon and handed him off to Susan and me to transport him to Shreveport. It was there that I fell in love with him, but he is a big guy and I am looking for a little fellow to be Mr. Kippers’ protégé. From Shreveport he was picked up by Debra and taken to Longview, Texas where he was handed off to Kellie who took him to May in Dallas. May fostered him until Pegg picked him up and took him to Austin. He has been with Pegg ever since. Now we had the green light, but we needed to get him back to Dallas for a nonstop flight to Boston. Pegg put out the call and two people stepped up to the plate. 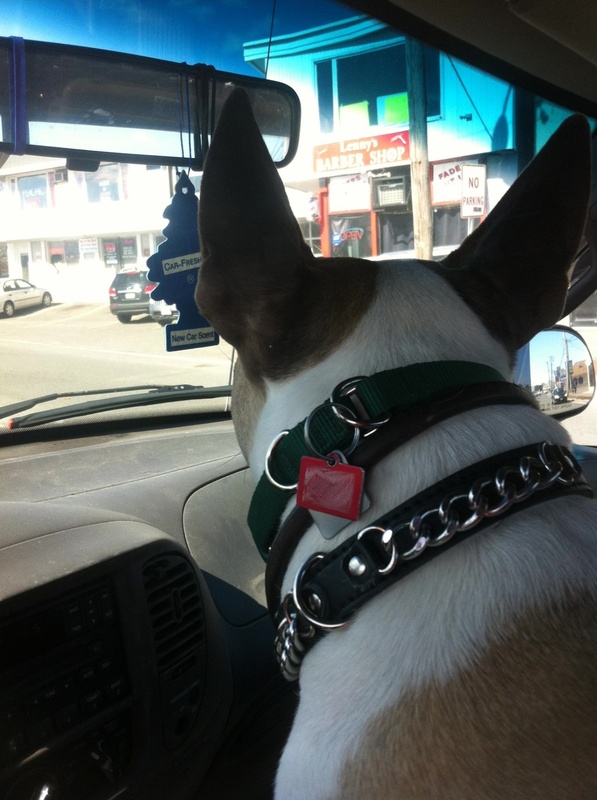 Kerri picked him up in Austin and drove him to meet Shelley in Temple, Texas. 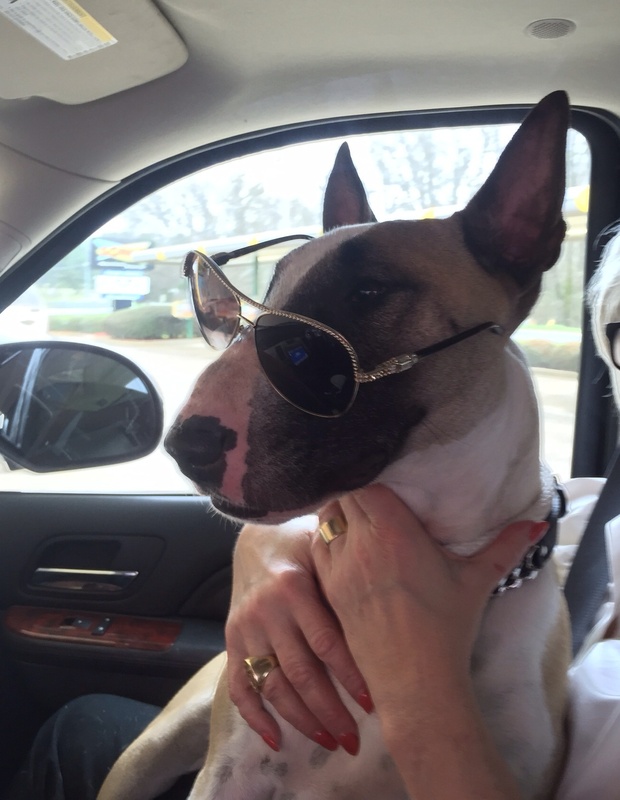 Shelley, a long time bull terrier breeder and rescuer even donated a gently used safe crate for him to be shipped in and drove him back to May in Dallas along with his health papers. May took him to DFW to catch his flight but they required a set of papers that none of us had been required to have in the past. So May drove him to the vet for the certification. His flight had to be changed until the next morning, so with the additional papers in hand, May took him home with her for the night. Up and at ‘em the next morning, the big bully and May headed back to DFW where he was processed in and boarded onto his flight to Boston and a life of which one can only dream. I know that I, and those who were involved in the last part of this story, watched the hours creep by as he winged his way to Massachusetts. Becca was so excited that she missed her turn into the airport, despite the fact that she knows it like the back of her hand, and the rest of us were counting down the minutes with her via a group text. 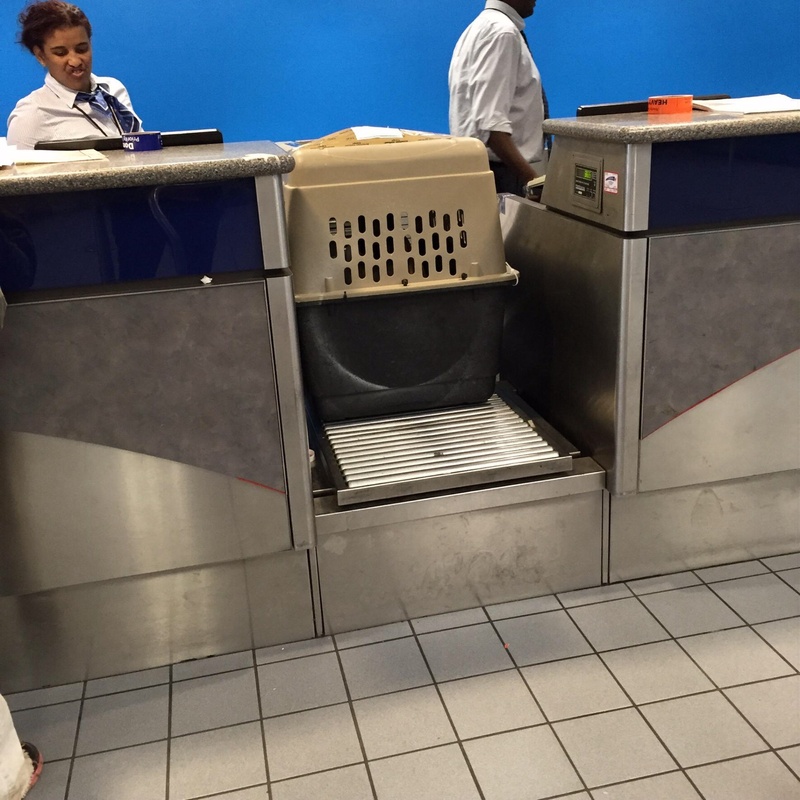 When the plane touched down at Logan there was a collective sigh from us all, but when Becca texted us that our bully boy bounded out of the crate and covered her face with bully kisses we were in tears. The next pictures she sent our group text were of him sitting “shotgun” in her truck and we all had a great laugh. The big bully who had traveled cumulatively over 2800 miles was ready to head to the house which would become his forever home. I wrote this story because it shows how many people it often takes to make certain that the life of an abused or abandoned dog is saved. Most of these people came in toward the end of the saga, but in the case of abuse, it often takes equally as many to literally save the dog before thoughts of adoption can happen. These foster people and transport people are truly angels. I know that four of those whom I have mentioned have gotten down into the trenches to save animals that others would not look at once. One of the ladies in this story had just finished another round of chemotherapy, while one other was caring for her hospitalized husband over the last few days. I personally want to thank each and every person who was involved in helping to get this bully boy to my friends in New England. A special thanks also to those on my FB page and Mr Kippers’ blog, who are continually supportive of his cause and other rescue causes which help save the abused and abandoned. Post script: Later that night Becca and I talked several times and she sent me a picture that she had not shared with the others because I wanted to unveil it in this story. The real reason this bully was chosen for her husband, as you already know, was to be a service companion. Bully Boy will begin proper training by Becca to be Bic’s service dog, in about a week, after he has had time to settle in and know that he is home. However, I doubt that any of you will have reservations on this placement when you see the attached picture below. Bic was at home on the sofa when Becca walked in with Bully Boy and, well, a picture is worth a thousand words. Bully Boy knows, already, that he is going to spend the rest of his life as a service companion to a man with whom he is already bonded. What a beautiful story! I am so happy for the dog and people involved. Happy trails to all! This is truly one of the most magnificent chapters in “Mr. Kippers’ Incredible Story”, as there are many. I have never thought for a minute that his notoriety, and you and Gordon’s far reaching friendships. will ever “tail off”. Nope. In fact, these synchronicities between caring peoples surely have the wings of a few angels blowing every single heart in the right directions! You and your furry fellow are the stuff dreams are made of for every pup who needs their own loving lap as much as we need that very special pup upon it. A most memorable account of all the efforts that take place strictly out of love for the companions that make our lives so rich, this one, alone, would make a great guide for children and adults across the ages who want to learn the best scenarios of rescue. the spirit of “rescue people” is unmeasured!. no ones heart hurts more or is more happy> truly a great story! thanks for making my day!! Thank you and all of the wonderful people who rescue these precious creatures! Wishing God’s blessing on all! The most beautiful story. Thank you sweetheart for sharing. God is good. HE blesses everyone and you and Gordon are his angels on Earth. The intuitiveness of dogs still astounds me. Their love is so unconditional. What an amazing story. 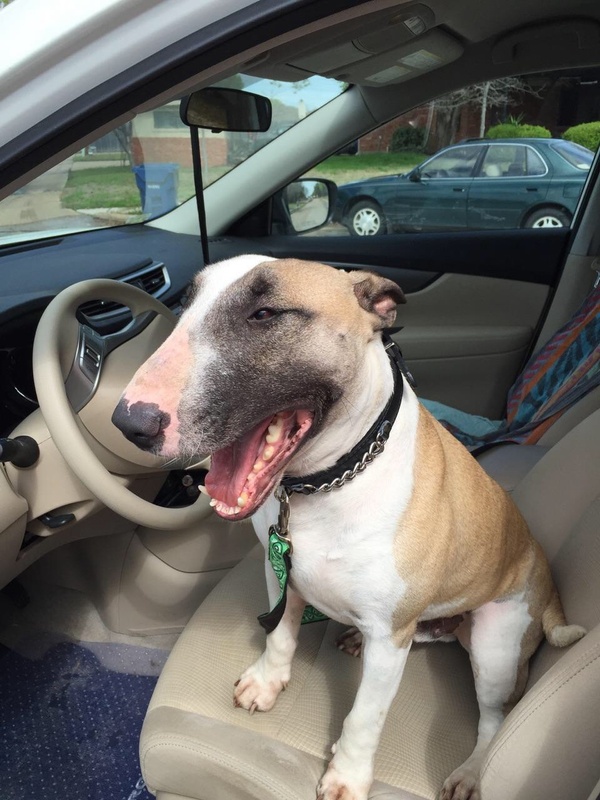 Kudos to everyone who had a part in the rescue and perfect placement of this special bully. God breezes blowing for sure! Such a touching, enchanting story of love for this bully. Thank you. Sobbing!!! Great story!! Dog happiness! Becca and Bic are two of my most loved friends. Thank you to everyone who had faith and made this work! I think I can speak for all who had a hand in this “Easter Miracle in Dogdom” when I say that it has brought as much joy to us as it has to Becca and Bic. You have no idea how touched I am by your lovely comment. Isn’t it phenomenal how goodness and kindness comes full circle? I am not surprised by your story though, I cannot imagine Becca and Bic being any other way than kind and generous in your time of need. God does work in mysterious and wonderful ways and “paying it forward” is the focus of Mr. Kippers’ Classic Kippers company which benefits rescues. I can only imagine what a wonderful world it would be if we’d all pay forward a kindness!